The reports are becoming clearer and clearer, the rematch between Manny Pacquiao and Floyd Mayweather Jr. looks like it’s going to happen. As to when that fight is going to happen we aren’t sure. TMZ recently reported that Mayweather is planning on a tune up fight in Tokyo before coming back to fight Pacquiao again. Mayweather also posted a video where he indicated that before he fights Pacquiao he will be back in Tokyo for a huge boxing event. The belief that the fight will be a dud has already spread to boxing fans on social media, with some fans indicating they’ll watch them fight again, but many promising to not waste another dollar on it. But many who now claim they won’t watch the rematch aren’t telling the truth. The buzz behind a possible rematch began to hit social media the day before the Golovkin and Canelo rematch; when Mayweather and Pacquiao “ran” into each other in Japan and verbally agreed to fight each other in December. The talks of the rematch trended on social media and news outlets around the world began to pick it up and report on it. Will the rematch be as boring as their first fight? There are reasons to believe it won’t be. One of the biggest stories to come out of their first fight was Manny Pacquiao undergoing arthroscopic surgery to repair his injured right shoulder immediately after his loss. 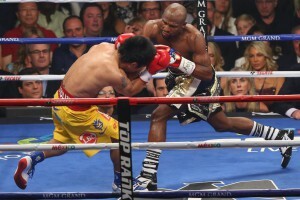 Pacquiao’s seemingly reluctance to throw right hooks and jab was evident from the third round on. Some believe Pacquiao’s shoulder wasn’t really injured, but his surgeon seemed pretty convincing when talking about the surgery that it was a legitimate injury. Pacquiao had asked for an anti-inflammatory shot on his shoulder on the night of the fight, but the Nevada athletic commission denied it. Pacquaio has also has had his fair share of rematches, and many of them turned out to be successful fights for him. Can he continue that trend with Mayweather? Consider the following: Pacquiao fought Erik Morales in March of 2005 and lost the decision. He went on to face Morales two more times, in 2006, and was able to stop him both times. He fought Marco Antonio Barrera twice and was able to beat him both times. He fought Marquez four times. He drew with Marquez the first time, beat him by a close decision twice, and was knocked out his last fight with Marquez. He fought Timothy Bradley three times. Lost the decision the first time and bounced back to beat Bradley two more times. Pacquiao has a history of rematches, and he usually does better the second time facing an opponent. Lack of activity may also be of some concern for Mayweather. He did not fight at all in 2016. His one fight in 2017 was against Conor McGregor, an MMA champion with no boxing experience. In reality, Mayweather hasn’t stepped in the ring against a legitimate boxer in three years. Pacquiao’s activity isn’t that of a young boxer, but since facing Mayweather he has stepped into the ring against several notable opponents. He defeated Timothy Bradley and Jessie Vargas. He lost a close decision to Jeff Horn in a match that nearly everyone feels he should have won. He also had his first stoppage victory in years against Lucas Matthysse in his last bout. Three years without facing a legitimate boxing opponent and choosing to step in the ring against an all time great like Pacquiao is a fact that most are over looking. Finally, one of the biggest differences in their rematch is Freddie Roach, or the lack of Freddie Roach. Roach’s hall of fame credentials as a trainer aren’t in question, but his ability to effectively train his fighters while Parkinson’s Disease ravages his body is a fair question. Mentally, Roach can probably still hang with the best trainers in the world. But it’s not a certainty that he can keep up physically when working with his fighters or doing pad work. Pacquiao chose his long time friend, Buboy Fernandez, as his trainer when he faced Matthysse. He also got his first stoppage in nine years with Buboy, and not Roach, in his corner. Can Manny beat Floyd? It’s still going to be a very difficult task. Mayweather size advantage will still be there, and getting past Mayweather’s five inch reach advantage will be very difficult for Pacquiao; especially when Mayweather is as fast, if not faster, than him. Manny’s best bet at victory would be to throw caution to the wind and fight like he has nothing to lose. He will have to go on the attack and be willing to take Mayweather’s best punches in order to land just one. He cannot win by being passive. He will have to fight with the same hunger and desire as he had when he was a young kid that was trying to fight his way out of poverty in order to have any chance of victory. If Pacquiao can show that he’s willing to go toe to toe for twelve rounds with Mayweather, it will be a fight worth watching.